Here is proof that poetry is alive and well. In my opinion, there isn’t enough of it around, so I’m overjoyed when something like this comes along. We ought to have a ‘return to poetry’ revolution and get our children reading more of this entertaining and valuable genre. Each poem is a short, well crafted story in verse; full of interest and simultaneously educational. The Sash tells how Ned Kelly saved the Shelton boy from drowning and was given a green sash as thanks. Simpson and His Donkey gives a salute to this historical and heroic event, and The Fire, told through a terrified child’s eyes, is about a family fleeing a bushfire. 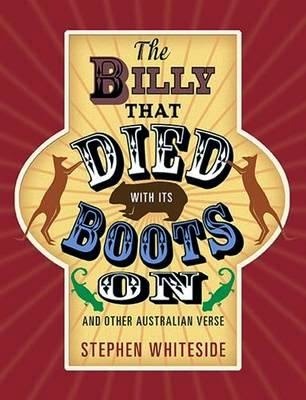 Stephen Whiteside has written over 1000 poems for adults and children. His work is meant to be read aloud and in this collection, there are two poems at the end for performance. Short and long, wide and narrow, every poem is a careful construction. There are so many themes and subjects included here. Not a boring word can be found in the 154 pages of 65 poems listed under 15 categories. These poems are clever, insightful, humorous, moving and highly readable. This book is a good investment that will gather interest over and over again.